A young girl learns that her footprint is more than the mark she leaves in the sand in this eco-conscious picture book for budding young environmentalists. Sandy loves visiting her grandpa's house by the beach every summer. She plays in the sand while her dog, Pepper, chases the seagulls. But this day her walk on the beach is ruined by a pile of garbage. Why would someone dirty her beautiful beach? The arrival of the “Garbage Lady” inspires her, as she explains to Sandy that everyone has an ecological footprint – the mark they leave on the world – and that it is their responsibility to shrink it. Sandy's Incredible Shrinking Footprint is printed on Forest Stewardship Council (FSC) certified paper. 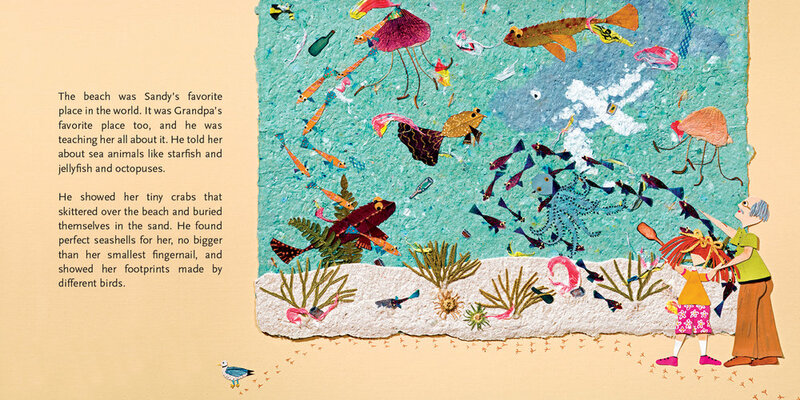 The art for this book was made using a collage of reused, recycled, and natural materials. Femida Handy, a professor of Environmental Studies, began using the term “ecological footprint” in the 1990s. She realized how easily the idea could be taught to children after making up stories for her own children using the idea of footprints on the beach. She is both a professor at York University and at the University of Pennsylvania. Carole Carpenter established the world’s first Children’s Studies program in 2006 at York University in Toronto. The program aims to teach people how to listen to children, to learn from them and to work in their best interests. Carole continues as a professor and coordinator of the pioneering program in Toronto, where she makes her home. Adrianna Steele-Card used her training in a variety of media to create her unique form of collage art. She used a combination of natural and recycled materials, highlighted by paints and fibers. Look closely and you will find fish made from leaves, cloths made from flower petals, and a host of other surprises. Adrianna, a professional artist, lived and worked in the woods of Lanark Highlands, Ontario. Adrianna passed away in 2013.